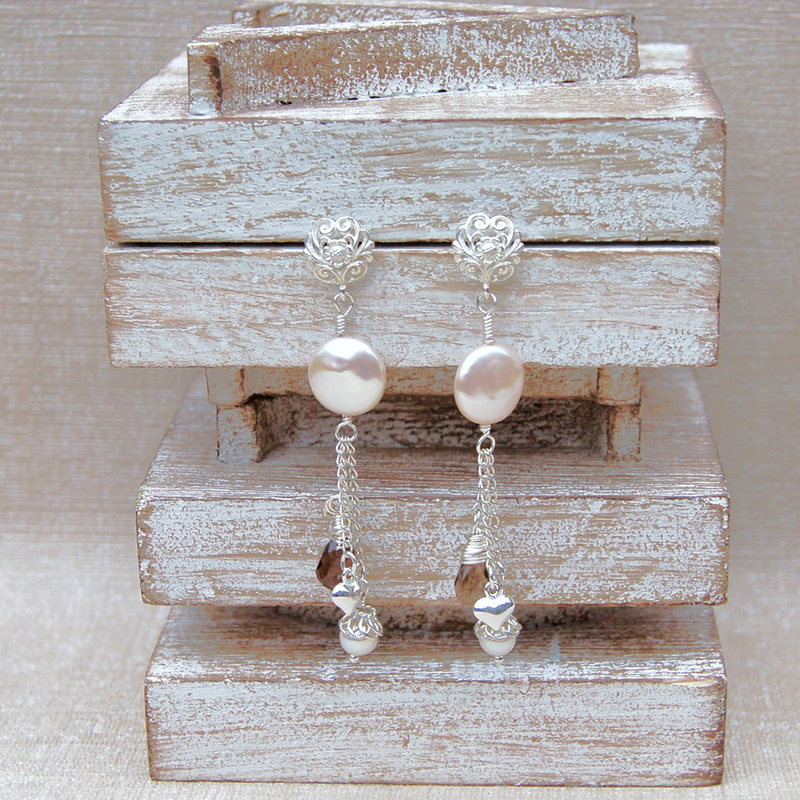 These stunning earrings were designed and made with the principal in mind of being worn for any occasion. So if you are looking for an elegant present for Mum,Wife or girlfriend then you won't go far wrong with these delightful earrings. 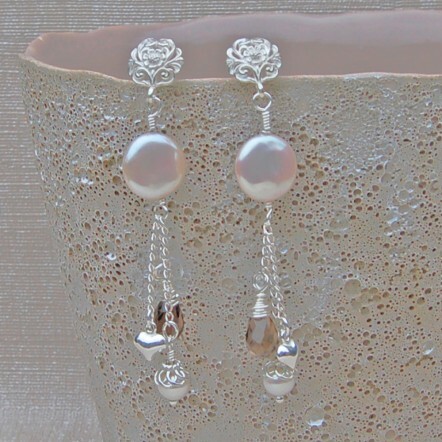 If you are looking for earrings for a specific occasion such as a wedding then these would make a delightful addition to your big day. 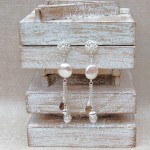 A wonderful pair of radiant coin pearl dangle earrings that can be worn for any occasion. 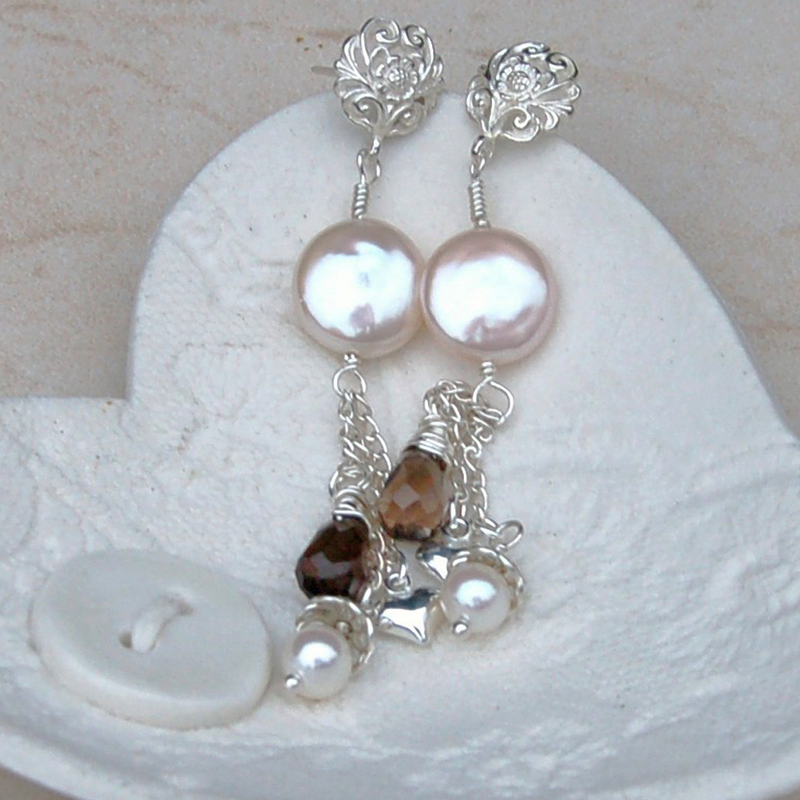 The components we used to make these adorable earrings are as follows – We used a stunning 12mm grade A white freshwater coin pearl which is so smooth and round and has a radiant glow. 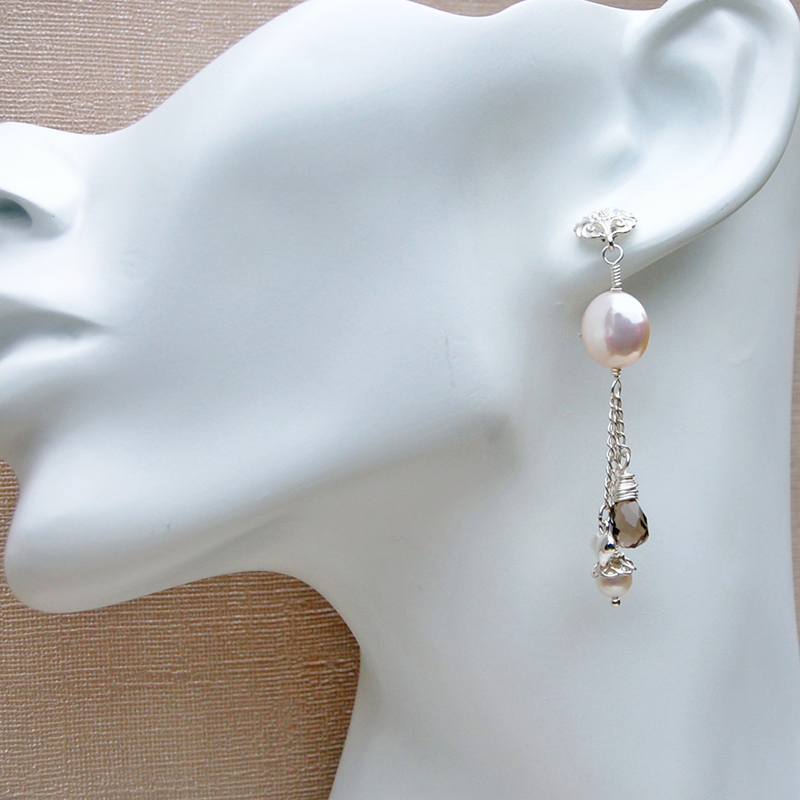 The ear wire we have used is sterling silver and has a beautiful ornate design to it. 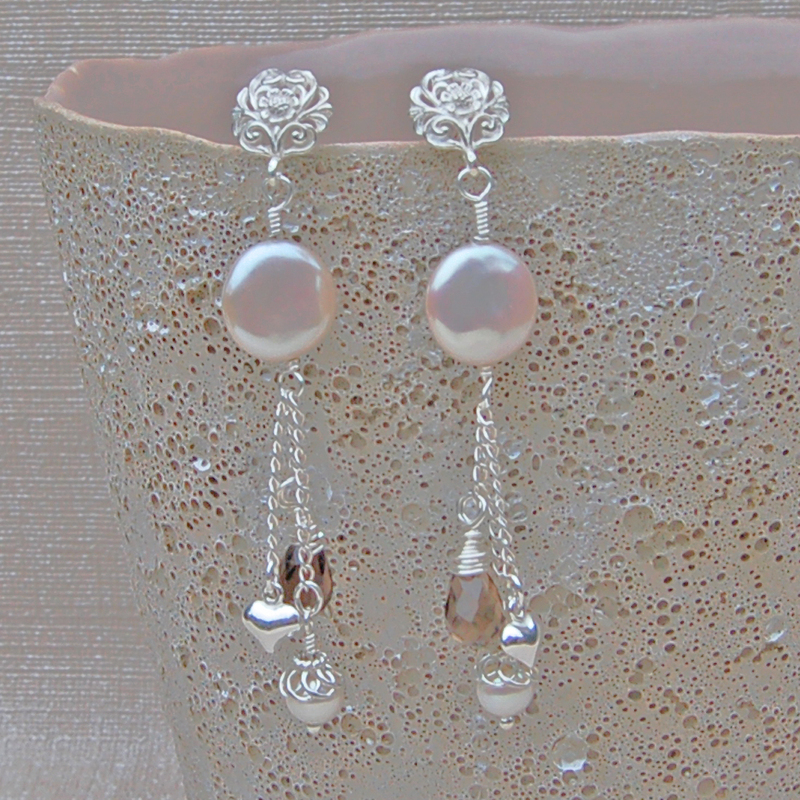 Hanging from the coin pearl we have three sterling silver dangle charms at varying lengths. The first of these is a sparkling smoky quartz briolette 6mm x 9mm which is multi faceted and just oozes elegance. Next we have a AA white freshwater round pearl which measures 5.5mm and is fitted with a lovely ornate bead cap and finally we added a cute little puffy sterling silver heart charm which is 7mm x 6mm to complete these earrings. Sterling silver is one of the worlds most precious metals and it will tarnish over time. To keep your silver looking fresh there are a couple of simple tips to follow. Clean your sterling silver in warm soapy water ensuring that it is rinsed thoroughly and dried immediately to stop spotting. You can also clean your silver with a cloth, Make sure you use a 100% cotton cloth or a special sterling silver cleaning cloth as silver is a soft metal and can scratch easy. *please note* Please note that all pierced earrings will be sent sealed in a clear plastic bag for your inspection. If you would like to return your purchase, please ensure that the plastic bag containing your order remains sealed. If the earrings have been removed from the bag, the seal is broken or the bag has been tampered with in any way, we will be unable to refund or exchange the earrings due to hygiene reasons. If you are giving the earrings as a gift or if we are sending them directly to a recipient for you, we recommend that you inform them in advance of our pierced goods returns policy. 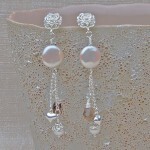 These earrings measure 6.5 cm long which is taken from the top of the ear wire to the bottom of the round pearl. 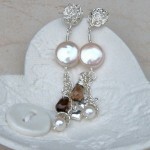 The widest part is the coin pearl which is 12mm.